Both torn from their homes in Laos, a boy and a moon bear cub form a deep bond in this “moving and memorable” (Kirkus Reviews, starred review) tale of impossible odds and resilient hope, based on true and tragic conditions in Eastern Asia. Twelve-year-old Tam, on a dare, ventures into a moon bear den in the mountains of Northern Laos. His goal is to steal the cub and sell it, making a fortune for his family. But the mother bear’s unexpected return upends Tam’s plan, and he barely escapes with his life. Then his life implodes anyway: his entire mountain village is forced to relocate to make room for a new highway. Lured by the promise of electricity, running water, and a television, Tam’s people move to an overcrowded village, where Tam’s father is killed by a stray landmine. Now the family breadwinner, Tam is forced to work hundreds of miles away in the city of Laos, at a moon bear farm where bile from bear gall bladders is used for medicine. 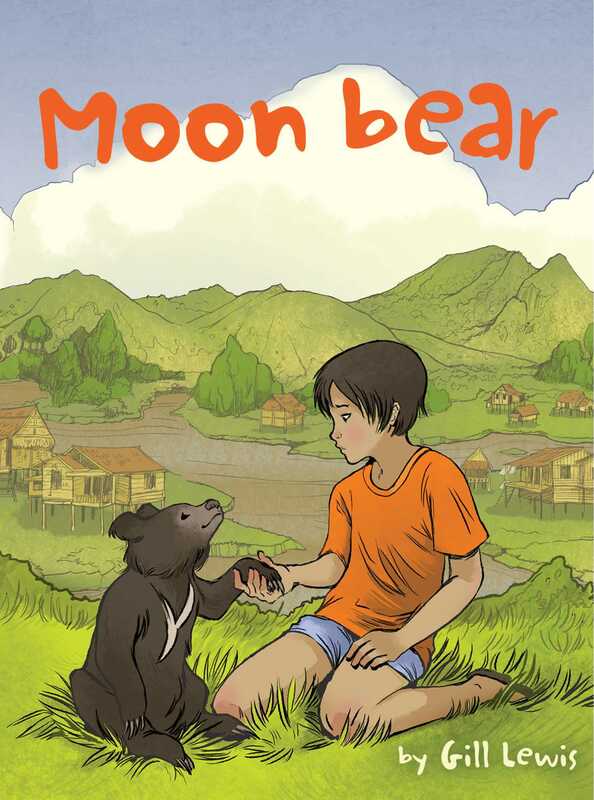 It is a cruel, miserable place, and when a familiar face—the very cub he’d seen in the den in Vietnam—is sold to the bear farm, Tam knows he must save this moon bear, no matter what it takes. Deeply and powerfully moving, Moon Bear is an unforgettable story of compassion, hope, and bravery against overwhelming odds, and brings to light the real-life, heartwrenching plight of Asia’s endangered moon bears. I scooped a handful of small stones and closed my fist, crushing the sharp edges deep into my skin. Stay awake, Tam. Don’t sleep. Don’t sleep. I looked across at Noy lying on the rock ledge beside me. His head had flopped forward into his arms, and he was breathing softly. I wanted to wake him. It was dangerous to sleep in the forest. Sleep loosens the souls and lets them wander. They could be coaxed away by evil spirits while he was dreaming. We wouldn’t want our souls to wander far tonight. I rubbed my eyes and breathed in deeply, filling my lungs with the cool night air. We had been waiting all night. Above, the moon had traced an arc across the sky. The bright star of the Tiger’s Tail had risen above the tree line. The forest was dark and still. This was the dark before the dawn. The dark when spirits walked. I wriggled forward and peered down from our high rock. Moonlight reflected from the wide pools below the waterfall, the ripples spreading out in perfect circles of bright, white light. The night scent of moth flowers drifted across the water. The whole forest was deep in sleep. Maybe Noy was wrong. Maybe it wouldn’t come tonight. I stared into the folds of darkness on the far side of the river. In the deep shadows between the rocks and boulders, a darker shadow was stirring. I twisted a loose piece of forest vine through my fingers and watched. Despite the coolness of the night, my palms ran slick with sweat. I could feel the blood pumping through my hands. I swallowed hard. Below, some fifty paces away, the shadow moved. It formed, gained shape, and stepped out into the moonlight. The shadow rose up on its hind legs and sniffed the air. A bear. A huge bear. I’d never seen one before. It was taller than Pa. Taller even than the chief. The crescent of white fur on its chest was bright against the dark fur of its body. It sniffed the air again, its small round ears twitching in our direction. It was a bear of the old stories. A moon bear. A spirit bear. Crop eater. Man killer. I pressed myself into the rock. We were downwind, wrapped in shadow. The thunder from the waterfall drowned our noise. Yet as we lay still and hidden, I wondered if this bear could sense us somehow. Did she know we were here? Noy tensed up beside me. I could hear his breath, soft and shallow. I could feel him watching too. The bear dropped onto all four paws and leaned forward into the river. She dipped her head low and drank, gulping the water, her ears swiveling backward and forward. I looked down to the river. The bear was thin. She’d eaten our crops and broken into the feed store. She’d put fear into all the mothers of the village. Yet no one had managed to catch her. Grandfather said she was clever, and dangerous, too, if she had cubs. I thought of Ma. If she knew I was here trying to take a cub, she’d kill me. “D’you really think she’s got cubs in there?” I said. No one had seen a bear for years. Grandfather said they’d been hunted into the deep forests. But he’d seen one once when he was young. He’d seen a bear push a man down and tear off half his face. He said bears were more feared than tigers. The bear sniffed the air again and set off down the river, jumping from rock to rock, using the river as her path down to the village fields. “I thought we were going in together,” I said. I glared at him. We were born the same night, under the same moon. We were twelve rains old. People said we shared our souls like twin brothers. Yet Noy was the chief’s youngest son. He always got his way. “Go on,” said Noy, giving me a shove. “What if she comes back?” I said. I looked along the river. It was a long, straight stretch, stepped in waterfalls. The bear was swimming away from us in one of the deep pools. I held the flashlight between my teeth and gripped the vines in my hands. I scowled at him. This wasn’t about a bear at all. It was about Noy wanting to get one up on his brother. I lowered myself into the river gully and stood on a rock and listened. I strained my ears into the darkness. A light breeze sifted through the canopy of leaves above. Frogs chirruped from the slack water and puddles at the river’s edge. I knew I wouldn’t hear a bear. Grandfather said you never hear a bear. They walk like spirits through the forest. If you meet a bear, you cannot outrun, outclimb or outswim it. You must become still. You must become like a spirit too. The river was low. The rains had yet to come and fill the river gorge with tumbling fast water. I stepped across the domed rocks to the far side, to the deep shadows of the bear den. What if there was another adult bear inside? What if the cubs were big enough to fight? I glanced back up the steep ravine. I couldn’t see Noy, but I knew he was watching me. Maybe this would be one dare too far. I switched on the flashlight. Its light gave a dull yellow flickering glow, barely enough light to see by. It was Noy’s brother’s, and I guessed Noy hadn’t asked to borrow it. I edged my way into the entrance to the den. A low tunnel sloped upward, deeper into the rocks. The ground beneath was damp and earthy. The rock walls were cool to the touch. I felt my way forward. The narrow passage opened out into a small cave, just big enough to fit a bear. It smelled clean and fresh as if a channel of air flowed through from the outside. I shone the light around the empty space. The cave floor was strewn in dry leaf litter and shredded twigs and branches. The soft earth was hollowed and coated in a layer of black fur where the bear had lain, curled up, asleep. I traced my fingers through the dry leaves and could feel the warmth from her body still in the ground. Something had squirmed beneath my hand. I shone the light downward. Half hidden in the leaves, a black shape stretched out a stubby paw. Small eyes blinked in the light. A bear cub, no bigger than a piglet, nuzzled toward me, poking out its flat pink tongue. I stared at it. The mother must have been starving to leave it here alone, unguarded. It wriggled onto its back, showing the crescent moon of white fur on its chest. A whorl of white hairs above the crescent looked just like the evening star. I couldn’t take this bear cub. Could I? It was still feeding from its mother. It was much too young. I stared at the cub. A hundred dollars. Fifty dollars for Noy’s family and fifty for mine. It was more than Pa could ever earn selling honey and bush meat. Maybe we could even buy a buffalo. Somewhere outside, a gibbon called into the night. It sounded far, far away. Deep inside the cave it was quiet and still, sealed from the outside world. The cub was safe in here. Held. Protected. Maybe I’d tell Noy there was no cub. It didn’t seem right to take it. But a hundred dollars! We’d never get this chance again. The gibbon called again, a high alarm screech. Something had rattled its sleep, but I felt strangely safe inside the curved walls of the den. I ran my finger along the soft belly of the cub. Another screech, more frantic this time. A warning. I jolted upright. My heart thumped in my chest. Noy’s warning: a gibbon’s call. The mother bear was coming back. 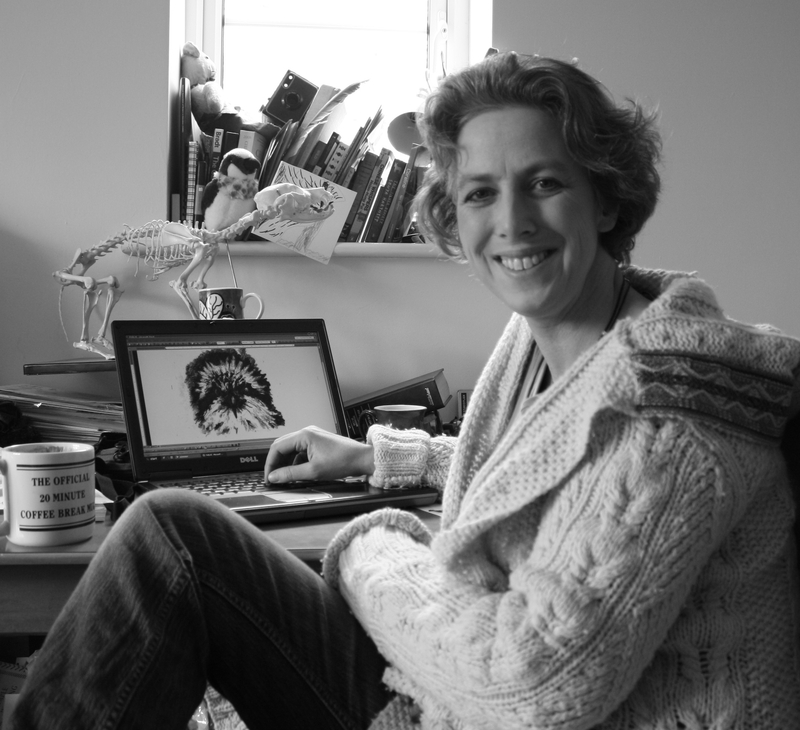 I grabbed the cub by the loose skin at the back of its neck and groped my way along the passage. She shouldn’t be back. Not yet. Noy said she’d be a long time in the fields. Why had she come back so soon? I stumbled out of the cave into the hard black body of a bear. I tripped and sprawled on the rocks, losing my grip on the cub. The mother bear spun around. She bent her head and snuffed her cub, glaring at me with her small dark eyes. She was so close I could feel her, smell her, and hear her breath. Her lips peeled back to show the yellowed canines in her jaw. I wanted to press myself into the ground and become rock too. I closed my eyes. Become spirit. Be still, be still, be still. I waited for bear teeth around my skull. I opened my eyes. The bear was standing on her hind legs, her attention fixed on something in the valley. She sniffed, the tip of her nose reaching high into the air. “Uff!” she grunted. A warning from deep inside her chest. “Uff!” She dropped down and picked up the cub. It dangled from her mouth by its scruff, its paws curled beneath it. The mother bear leaped across the river into the shadows and was gone, leaving only spreading rings of light where her feet had touched the water.